By Judy Haiven. She is a member of Independent Jewish Voices-Canada (Halifax chapter) and Solidarity Halifax, and she teaches at Saint Mary’s University. Originally published at the Halifax Media Coop. Every day at 12 noon, at the blast of the ceremonial cannon fired from Citadel Hill in Halifax, a more important event takes place just below the Hill. 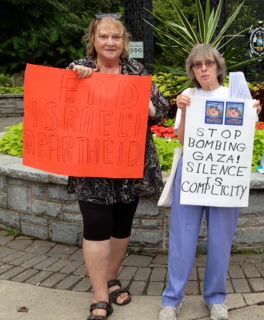 Every day, a growing number of Halifax residents stand for 30 minutes outside the gates to the Public Gardens armed with signs against Israel’s bombing of Gaza. 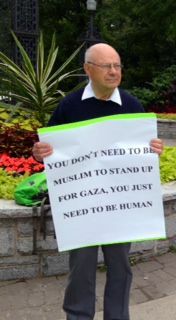 Anyone can join us.Members of Canadians, Arabs and Jews for a Just Peace, Independent Jewish Voices-Canada (Halifax chapter), Students Against Israeli Apartheid at Dalhousie and other volunteers hold up signs to passersby and drivers at the busiest intersection downtown. One sign spells out the daily death toll – with earlier numbers crossed out — over the last month of Israel’s attacks on Palestinians in Gaza. 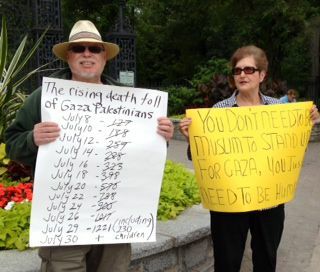 The sign features the up-to-date numbers of children and adults killed.Another sign reads: “You don’t have to be Muslim to stand up for Gaza: you just need to be human.” And one homemade sign reads “Israel: Stop killing children.”Some people stop by and ask what we are doing, others ask what they can do. Of course every day there are two or three self-righteous men (and they are always men, usually accompanied by silent women) who tell us we don’t know anything and that Gazans ‘deserve’ what happens to them. But does anyone ‘deserve’ to have their limbs cut off by Israel’s DIME (dense inert metal explosives) weapons? According to Norwegian doctor Mads Gilbert who has volunteered at Al Shifa hospital in Gaza City in the last month, DIME weapons cause “horrendous injuries where arms and legs were cut off as though a huge axe had chopped off their limbs…” The use of these weapons are illegal under international humanitarian law. What about the nearly 398 children who have been killed, and the thousand that are horribly maimed – do they ‘deserve’ what Israel is doing? Or the elderly, the disabled, and other civilians – do 1766 ‘deserve’ this torture? So now every woman, older person, teenager, child is the victim of Israeli terrorism. It’s astounding how similar the Tory and NDP position are. Finally, email your MP, from whichever party. Demand that Canada tell Israel to stop the bombing. We’ll be in front of the Public Gardens every day till the bombing stops. Join us. Sharon and Linda with their signs.